The highly capable 2015 Volkswagen Beetle makes its way back onto the scene this year with an array of new and updated features. A new trim level, Beetle Classic, is now available on the lineup and the 2.0L diesel engine receives an increase in power. Additionally, a standard rearview camera is now equipped on all models. 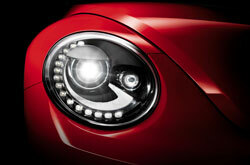 The Beetle also continues to deliver top-notch fuel efficiency and performance, while donning a fun exterior design. To find out more info about the revised model, check out our 2015 VW Beetle review below. With its unique styling and first-class features, the 2015 Volkswagen Beetle in Orlando is a one-of-a-kind vehicle. The hatchback is available in both coupe and convertible configurations, with each offering top-notch components. A panoramic sunroof, keyless ignition/entry, Bluetooth, heated mirrors and cruise control are just a few of the options offered on the Beetle. The all-new 1.8T Classic Beetle model also comes with navigation, satellite radio, a touchscreen display, lumbar adjustment for the front seats and updated interior materials, delivering a greater experience for drivers and passengers. 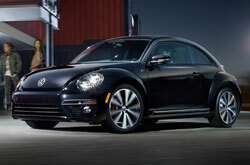 Three different engine options are available on the latest 2015 VW Beetle in Orlando. A 1.8L turbocharged four-cylinder serves as the base option, and produces 170 horsepower and 184 lb.-ft. of torque. It can be matched with a five-speed manual or six-speed automatic transmission. All Beetle R-Line model receive a turbocharged 2.0L four-cylinder engine, delivering 210 horsepower and 207 lb.-ft. of torque. A six-speed manual or six-speed automated manual can be paired with the engine, which deliver incredible fuel economy. 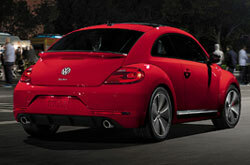 The Beetle TDI comes equipped with a turbocharged 2.0L diesel that outputs 10 extra horsepower this year. It now rates at 150 horsepower and 236 lb.-ft. of torque, and offers an EPA-estimated 34 mpg combined, helping drivers preserve fuel. For details about the latest Beetle, continue browsing our 2015 Volkswagen Beetle review. 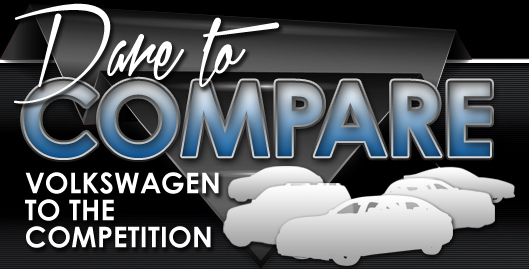 Is the Volkswagen Right for You? The 2015 Fiat 500, Mini Cooper and the Scion iQ are outranked by the 2015 Beetle in many areas. With leading-edge features and an exquisite design, shoppers will love the Beetle. You'll certainly see it's a phenomenal value when you compare its price to competing vehicles. Find out more - Take a look at the bullets below! If you have any questions about the 2015 Volkswagen Beetle after reading our review, please contact David Maus VW South for answers. We are a leading Volkswagen franchise in Orlando, and it's our responsibility to supply you with reviews recorded by some of the finest automotive writers in the industry. Crammed with precise information and specs, each paragraph gives you complete details about all the Beetle has to offer Orlando drivers in terms of cabin amenities and much more. Thank you for viewing David Maus VW South's 2015 Beetle review. Now that you know more about the Beetle, contact us to learn about great lease offers and OEM specials that can help you lower the price on your purchase.